A surcingle is a necessary piece of equipment for ground driving and is ideal for teaching a young horse about girth pressure. A surcingle for ground driving should have appropriate rings for driving lines, must fit a reasonable range of heart girths, be sturdy, safe, and easy care. 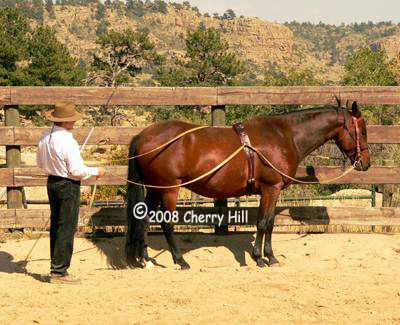 Long-lining is an important part of a young horse’s training. (Long lining is also referred to as ground driving.) 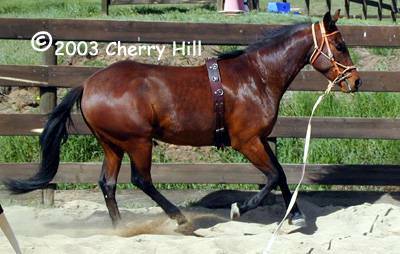 It teaches acceptance of girth restriction, accustoms a horse to the presence and actions of a bit, and introduces bending. Long-lining is also a valuable means for fine-tuning certain points with intermediate and older horses: bending and flexion, flying changes, and upper level dressage movements. A surcingle encircles a horse’s heart girth, acting as a mini-saddle and girth. For ground driving, the trainer runs long lines through the surcingle’s side rings in a horse’s early training and then through the top terrets or rings as the horse advances. 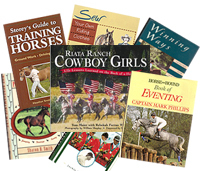 A horse can be driven in front of the trainer, beside the trainer as both walk along, around the trainer in a circle, or in patterns such as figure eights or serpentines in the arena at large. Most surcingles are designed to be used directly on the horse’s back, with a surcingle pad, or with a regular saddle pad. Some can be used over the top of a saddle. This is convenient because if a horse needs to be long-lined prior to riding, you won’t have to return to the barn to change tack. However, using a surcingle over a saddle can create problems. It can slip from side to side when turning (the smooth leather covering of the surcingle padding + the the smooth leather of the saddle seat = slip, no friction). This is especially likely if the horse made a sudden wrong move such as young horses do. Slippage can be avoided if the surcingle is fastened excessively tight but extreme tightness can cause even a seasoned horse to buck! Also you might find when using a surcingle over the top of a saddle that when you are asking the horse to perform serpentines and flying changes, the long line of the “old bend” can get caught on the cantle of the saddle after the horse changed to the “new bend”. To remedy this, you can either “pitch a wave” in the line (without bumping the horse’s mouth) hoping to get the new outside line over on top of the seat of the saddle again OR you must stop the horse, gather up the lines, walk to the horse, lift the line from behind the cantle and then resume. After several such instances occurring just after a spectacular flying change where we couldn’t reward the horse with forward movement (instead had to stop and regroup), you’ll likely abandon over-the-saddle driving and use the traditional surcingle position, that is directly on the horse or with the use of a normal saddle pad. Generally surcingles are comprised of a top portion and a girth. The top portion is made up of the saddle and the side pieces. The saddle consists of a padded pommel that sits on or behind the withers. The padding varies from a flat profile (1/2″ or less) saddle consisting of a thin layer of padding in the wither area to a high profile (2″ or more) saddle made up of two triangular-shaped blocks of padding. The padding and its covering varies from very soft to hard. The saddle and side pieces have attached to them various terrets, large D rings, and small D-rings. The standard configuration is 2 large rings (or terrets) on top, 2 large rings on the sides, and 3 pair of small rings in between. Terrets are rigid, fixed rings that are screwed into the top of the saddle at the approximate position a rider’s hands would be. Because terrets do not move during the driving process, they are very desirable. In lieu of terrets, most surcingles have large D rings sewn or sewn and riveted into the top of the saddle. Some Ds stand in a rigid position – others are floppy. Rigid top rings are desirable because the lines flow through them freely. In addition to the top terrets or rings, there is usually a set of large D rings on the side pieces of the surcingle for using the long lines in lower positions. These D rings might be sewn or sewn and riveted in place and vary from almost rigid to floppy. Either seem to work OK in the side position though I prefer rings that stand out to the side so the long lines can run freely through them. There are a varying number and size of smaller D rings (customarily 3 pair) on the top of the surcingle for attaching side reins and other training equipment. Most surcingles have two standard billet straps on each side such as are found on English saddles. Some surcingles have a single wider billet on each side. Most girths are a separate piece. The girth of a surcingle will vary in length depending on the design of the top portion of the surcingle and the size of horse the surcingle is intended for. The girths can range from 16 to 30 inches in length. The standard girth has two buckles on each side to correspond to the 2 girth billets. Most girths have at least one D ring sewn on the bottom side for the attachment of training equipment between the horse’s front legs.